Factors that improve upstream productivity in mammalian cell culture-based manufacturing are many and varied. Michael Betenbaugh, Ph.D., professor of chemical and biomolecular engineering at Johns Hopkins University, says that the elucidation of the Chinese hamster genome will create opportunities for approaches based on proteomics, metabolomics, and glycomics, as well as genomics, for characterizing and adapting CHO cells. He describes one approach, using microRNA, on CHO cell apoptosis. Cell viability is a huge factor in the success of CHO cultures. Dr. Betenbaugh induced apoptosis in cells by exposing them to nutrient-depleted media and found upregulation of endogenous microRNAs associated with cell death. One upregulated gene out of 38 proposed microRNAs, mmu-miR-466h, inhibits anti-apoptosis genes. As predicted, knockdown of this gene reduced apoptosis. “We were able to change the trajectory of viability for these cells,” says Dr. Betenbaugh. In addition to studying regulatory microRNAs, he is using a proteomics approach to determine which proteins may be involved in apoptosis and other cell activities related to cell culture productivity. The value of omics analysis in CHO cell-line optimization is the ability to compare, through several (and sometimes orthogonal) approaches, high-producing or more viable cells from undesirable cells without directly quantifying either viability or product proteins. MicroRNA has two limitations. Of minor importance is that microRNA gene inactivation tends to be transient. More useful knockdowns would persist for the life of the culture. More significant are a cell’s ability to work around artificial states such as gene knockdowns, and the presence of multiple regulatory genes. Several talks at Select Biosciences’ “Cell Culture” conference will shed light on current modes of thinking among upstream specialists. Matthew Croughan, Ph.D., professor at the Keck Graduate Institute, will focus on new methods to control cell metabolism and advanced mass transfer strategies to achieve high titers and cell densities. The need to control metabolism arises from the successes of modern mammalian cell culture: As cell densities increase, so do concentrations of waste products like lactic acid and ammonia. Dr. Croughan is looking at four techniques to reduce the waste burden in fed-batch cultures. The first, reducing lactic acid production through feedback control of glucose, is based upon careful monitoring of “pH trajectories.” This approach, developed at Pfizer and known as HIPDOG (high-end pH-controlled delivery of glucose), is based on the fact that cells consume lactic acid when glucose levels fall below about 1 mM. As acid levels fall, pH rises. Researchers devised a feeding method that delivers concentrated glucose solution, in response to rising pH, which reduces lactate accumulation during the cells’ growth phase. The next technique, a patent-pending method invented by Dr. Croughan and Nate Freund, a former student, reduces lactic acid and ammonia production by adapting cells to high (40 mM) lactate. The other approaches involve reducing lactic acid production by transfecting cells with anti-apoptosis genes and controlling cell metabolism through “advanced flux modeling” and medium optimization. The material in this article related to Dr. Betenbaugh describes the anti-apoptosis approach. The last technique was developed by Bernard Palsson, Ph.D., professor at the University of California, San Diego, and commercialized by GT Life Sciences, a division of Intrexon. All well and good, but can these techniques be used together to create super-cells and super-cultures? Dr. Croughan is cautiously optimistic. Interestingly, some of these techniques are being applied to transiently transfected cells, which currently produce at much lower levels than stably transfected lines. Transient transfections are normally conducted at research or investigational scale, but the extra productivity cannot hurt. Engaging in DOE is critical for situations where selected cell lines do not scale to larger bioreactors. The idea is to get cells into controlled reactors early, to avoid pursuing cells that are “winners” in shake flasks but bomb in bioreactors at 3 or 20 liter scales. Microbioreactors, which have become popular tools for DOE in cell culture, reproduce the critical parameters affecting productivity at large scale. Several companies sell these systems in various reactor sizes, and with varying levels of control. 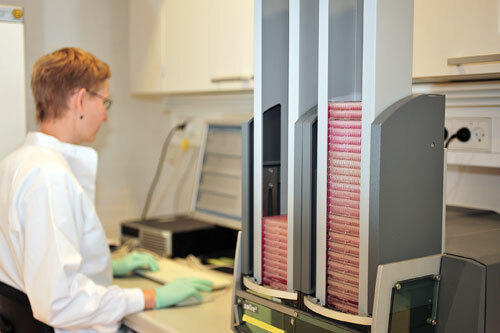 TAP Biosystems’ ambr™ cell culture workstation holds up to 48 bioreactors, of up to 15 mL each of working volume; the Biolector from Dasgip, a company just acquired by Eppendorf, monitors cell growth and output in 96 wells at up to 1.5 mL per reactor; Seahorse Bioscience weighs in with 0.7 mL SimCell™ system with up to 1,200 individual reactor wells. About one year ago Pall entered the microbioreactor marketplace by acquiring MicroReactor Technologies. Microreactor’s Micro-24 Microreactor System was originally distributed by Applikon, but Pall has begun selling it directly to customers. DOE provides opportunities to gain deep insight into processes at the potential cost of data overload. DOE’s major limitation is getting carried away—over-designing an experiment to the degree that it eats up time and resources. Process developers must keep the distinction between high-throughput screening-type operations and experimental design. Biological systems are complex, and many factors affect productivity of cell culture processes. One cannot test for all possible properties. “You don’t want to do 500 experiments,” cautions Dr. Lau. Instead developers should keep the design space as simple as possible. This requires a high level of confidence in picking critical parameters and guiding the course of the experiment, as well as statistical savvy. At the meeting, Christian Müller, Ph.D., senior scientist at Symphogen, will talk about his company’s work on antibody mixtures. The idea of using multiple antibodies against a specific target is analogous to the antiviral cocktail approach for treating HIV. “The strategy mimics nature as well, where hundreds of antibodies are produced against antigens,” explains Dr. Müller. For example Symphogen’s Sym004 Phase II product consists of two antibodies targeting the epidermal growth factor receptor (EGFR) that when combined synergistically inhibit cancer cell growth in vivo and in vitro. In particular, Sym004 leads to extensive internalization/degradation of the receptor. On top of this, Sym004 blocks ligand binding, activation and downstream signaling of the EGF receptor, and activates immune-mediated killing of cancer cells. Symphogen’s SympressT technology allows production of two or more antibodies in a single batch. First, cell banks are made of stable CHO cell lines each expressing an antibody of the antibody mixture. The cell lines are then mixed, and polyclonal master- and working-cell banks are made, which is the starting point for manufacturing. Why deal with two differently transfected cells and potential problems upstream and downstream? The alternative, to generate the antibodies separately, is almost twice as expensive as through the Sympress process. Cell culture, harvest, and purification in Sympress proceed as they would for a single monoclonal product, and Symphogen has developed an analytical toolkit around characterization and release of the antibody mixture. “We use several orthogonal analytic methods drawn from standard antibody work, including ion exchange, reverse phase, and size exclusion analytical chromatography, plus newly developed methods e.g., using mass spectroscopy and quantification of antibody mRNA levels,” says Dr. Müller. The difficulty, and the innovation, involve selecting antibodies that potentiate each other’s function. One would not want proteins that target the same epitope on the target cell, for example, or they would compete with instead of augment each other. The other concerns involve determining the optimal antibody ratio, and then matching the productivity of cells for individual proteins with the desired concentration in the final product. Since developing medicines like Sym004 requires balancing the effects of two antibodies, it requires some additional preclinical work compared to single antibodies. The potential reward, however, is greater efficacy and much lower cost compared with administration of two separate drugs. So far, according to Dr. Müller, Sym004 “has superior efficacy in preclinical models than cetuximab” (Erbitux), a blockbuster EGFR monoclonal. Symphogen is using high-throughput proliferation assays in order to perform lead selection of antibody mixtures. To License or Not to License? Eden Biodesign, an integrated biopharmaceutical development organization and part of Watson Pharmaceuticals, follows a fairly typical cell-line optimization strategy: select the expression system (mammalian or microbial), choose a vector, and pick high-producing clones. Molecule type and post-translational constraints dictate the expressing organism, which further restrains choices of transfection vector. 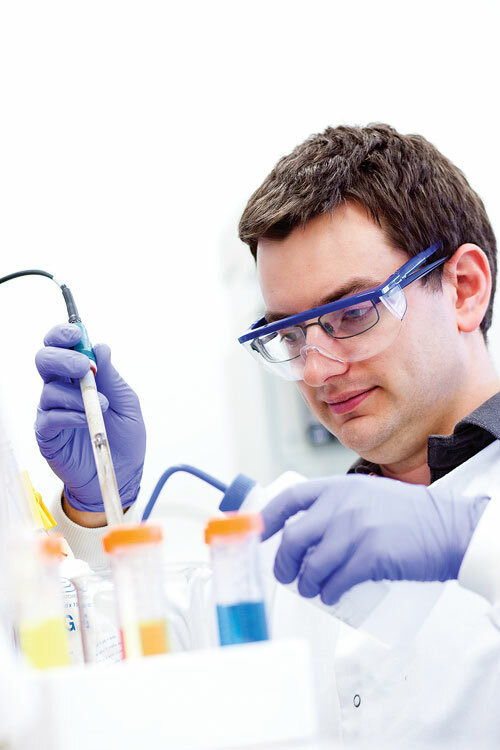 “If the product is relatively simple, lacking complex glycosylations, we might use a microbial cell line, which grows rapidly and is less expensive than mammalian cell culture,” says Philip Mellors, upstream development manager. For CHO cells, the critical decision involves whether to employ public domain or proprietary expression systems. Among the systems requiring a licensing fee Eden has employed are Lonza’s GS (glutamine synthase) System™, Millipore’s UCOE (ubiquitous chromatin opening element), and Selexis’ Genetic Elements™. Five products have been approved that use the GS System, including Zenapax® (Roche) and Synagis® (MedImmune). UCOE claims stability over 130 generations, while Selexis’ Genetic Elements improves expression by shielding critical genes from silencing effects, according to the company. And therein lies the conundrum. Companies short on time or manufacturing capacity might choose a commercial expression system to compress development times and reach the clinic faster, but it will cost more at every stage. Some licensors charge a flat rate plus an additional fee based on the success of the product. A royalty-free process, while slower and less productive, is more valuable to a potential partner or purchaser down the road. Thus the decision to license or not involves a complex accounting and statistical exercise. “Large companies would tend to go down the proprietary route since they have the money to pay up front and beyond, if necessary,” explains Mellors. For these firms, with potential blockbusters in their pipelines, time to market trumps what is viewed as an incremental cost. “But it’s always a tradeoff,” he says. Eden Biodesign follows a fairly typical cell-line optimization strategy: Select the expression system, choose a vector, and pick high-producing clones.